James Hansen – author of Storms of My Grandchildren. Barry W Brook – is the Director of Climate Science at Adelaide University, and Sir Hubert Wilkins Chair of Climate Change, is on the board of the Science Council for Global Initiatives and the International Awards Committee of the Global Energy Prize. Gwyneth Cravens – novelist and journalist, author of Power to Save the World: The Truth About Nuclear Energy. Ted Nordhaus – Chairman of the Breakthrough Institute, political strategist and author of Break Through, Why We Can’t Leave Saving The Planet To Environmentalists. Tom Blees – author of Prescription for the Planet (the seemingly “intractable” problem of nuclear waste is “nothing of the kind”) has “probably done more than anybody to move people to the cause of nuclear power.” Tom also heads the Science Council for Global Initiatives. James Lovelock – celebrated father of the Gaia principle. Fred Pearce – an environment writer with The Guardian newspaper in the UK, and author of The Last Generation: How nature will take her revenge for climate change. Stewart Brand – a prominent pro-nuclear “environmentalist” and author of Whole Earth Discipline: Why dense cities, nuclear power, transgenic crops, restored wildlands and geoengineering are necessary. Ken Caldiera – with the Department of Global Ecology, Carnegie Institution, recently co-authored an open letter to the environmental movement urging them to bring their support behind the development of new nuclear power. Kerry Emmanuel – with the Massachusetts Institute of Technology. He is known for his work on attribution of climate change to hurricane events. Rachel Pritzker – is the founder and president of the Pritzker Innovation Fund. Rachel currently chairs the advisory board of the Breakthrough Institute. Suzanne Hobbs-Baker – the brain behind Pop Atomic Studios, an organisation which uses the power of visual and liberal arts to “enrich” the public discussion on atomic energy. Spain’s deeply rooted distrust of popular participation in democratic processes is reminiscent of the swift, top-down transition some forty years ago. As such, it is a painful reminder of Spain’s unfinished revolution. Spain’s peaceful transition to democracy has been extolled as a model to emulate for democratizing nations across the globe. Following the death of General Franco in 1975, King Juan Carlos transformed the authoritarian regime into a European democracy, and did so without shedding a drop of blood. And yet Spanish democracy nowadays is not without its critics. The Catalan movement for independence unveils just what’s amiss in Spain’s celebrated democratic transition. In Berlin last week, constitutional scholar Bruce Ackerman singled out the Spanish transition to democracy as one lacking in authenticity and, ultimately, in legitimacy. The transition was negotiated between elites behind closed doors. Franco’s heir, King Juan Carlos, essentially preempted a revolt by co-opting opposition leaders Adolfo Suarez and Santiago Carrillo. A new constitution was drafted and passed through a popular referendum in 1978. Unlike the constitutional referenda in Spain’s northern neighbor France, however, the new law of the land was not subject to political debate. The public was never fully mobilized. This peaceful yet ‘unauthentic’ transition to democracy planted the seeds for grievances from Spain’s regional minorities. In its cultural and linguistic diversity, Spain resembles modern-day Switzerland and Belgium — a fact that Catalans are quick to point out. Yet this heterogeneity is not reflected in the Spanish constitution. The law of 1978 granted minorities broader powers than were in place, including a regional government, a state police force and recognition of minority languages. As has become clear in the decades to follow, and again in recent months, the same constitution also impedes minorities’ right to self-determination. Spain’s brisk constitutional process did not do justice to its regional minorities. Ethnically diverse democracies often thrive on complex power-sharing arrangements. A number of European countries, including Austria, Belgium, the Netherlands, Switzerland and, more recently, Bosnia, can attest to this. History has taught us that in ethnically diverse states, identity ought to take center stage when constitutions are drafted, or significant portions of the population will feel unrepresented and may eventually wish to jump ship, or worse. The tense standoff between Spain’s Prime Minister Mariano Rajoy and the president of Catalunya’s regional government Artur Mas has revealed Spain’s unbudging resistance to a democratic resolution of Catalans’ grievances. Madrid blocked not only the official referendum but also an unofficial consultation on Catalan independence through Spain’s Constitutional Court. (And it takes any opportunity to block social and economic legislation passed by the Catalan government.) Rajoy has refused to negotiate with the Catalan region and has called the recent referendum – which the region held in defiance of the Court’s ruling – an act of political propaganda. Spain’s intransigence is but a symptom of a deeper problem. Recall the brutal repression of high school students and teachers demonstrating in Valencia three years ago. The use of pain-inducing sound cannons, batons and rubber bullets against peaceful protesters is common practice in Spain. A bill introduced by the conservative Partido Popular in 2013 proposes to fine protesters up to 30.000€ for civil disobedience, videotaping the police or for simply gathering in front of parliament. Excessive use of force against demonstrators and repressive laws that restrict freedom of expression and assembly ignited a public statement by Amnesty International in 2011 (and again in 2013 and 2014). Spain’s deeply rooted distrust of popular participation in democratic processes is reminiscent of the swift, top-down transition some forty years ago. As such, it is a painful reminder of Spain’s unfinished revolution. While Spain’s elite — and particularly its conservative Partido Popular under Aznar and Rajoy — continues to practice politics old style, a new generation of politically active citizens gives reasons for hope. The peaceful and well-organized referendum in Catalonia last week is the culmination of a years-long grassroots movement, on which Artur Mas piggybacked two years ago. The rise of Podemos in the recent European elections is yet another example of grassroots at work. The far-left party rose not out of the Socialists but out of the indignados movement which itself gave rise to Occupy and numerous other social movements across the globe. A new generation of Spanish citizens is demanding inclusion in its state’s governance. Modern-day Spain made its first steps to democracy thanks to one leader’s political will. Franco’s heir invited outsider elites to take part in shaping Spain’s future in 1975. It is high time that Spain extend decision-making privileges once again — this time to its citizens. Spanish citizens, Catalans included, should determine their own future — be that a new constitutional arrangement or the breakup of the Spanish monarchy. Dani Marinova does research on political representation and democratization at the Hertie School of Governance in Berlin. In 2011-2012 she was a visiting researcher at the Autonomous University of Barcelona and attended several peaceful protests in Catalonia. The defense team of the South African police who dispersed a demonstration by killing 34 miners on August 16, 2012, said on Thursday that the surviving demonstrators should be charged with treason. The Marikana Massacre happened after the Lonmin mine workers started a strike to demand better wages. Prior to the massacre, two police were killed by the miners during clashes outside the Lonmin compound; however, the legal representatives of the miners union asserts that the police were killed by one or two workers and that not everybody was violent or even armed at the time. Ishmael Semenya, who is representing the South African Police Service (SAPS), says that the miners were planning to attack the police, a state organ, so they should be charged with treason. However, lawyer Dali Mpofu, who represents the miners, said that the tension was caused by the police, who failed to advise the demonstrators that they were planning to disperse the rally. Police assert that the miners, some of whom were armed with spears and sticks, tried to kill them; however, the union legal advisers assert that the police reactions were a result of the anger of their two colleagues’ death. Mpofu also said that the police acted on political considerations and rushed to end the strike, fearing Julius Malema, a controversial politician who is popular among the poorer sectors of the population, could interfere and worsen the situation. Malema said he was with the workers and urged them to maintain their strike. He has served in different public positions with the African National Congress party administration, but he was expelled from the party on 2012 over a hate speech accusation. Now he is commander-in-chief of his new party, the Economic Freedom Fighters. Both sides’ arguments were submitted this week, marking the final phase of the investigation being carried out by the Farlam Commission of Inquiry, which was ordered by President Jacob Zuma. JERUSALEM – An 11-year-old Palestinian child shot in the face by a sponge bullet during clashes in al-Issawiya on Thursday has been left blind in one eye, a local official said. Member of a local neighborhood committee, Muhammad Abu al-Hummus, told Ma’an that Saleh Samer Attiyeh Mahmoud, 11, was shot in the face at close range by Israeli forces firing sponge bullets in al-Issawiya during clashes. He was hit directly between the eyes, causing severe bleeding to his nose and the loss of sight in his left eye. The vision in his right eye is also severely damaged. Villagers in the East Jerusalem neighborhood were protesting the closure of three out of four entrances to the village by Israeli forces when the incident took place. Sponge rounds are made from high-density plastic with a foam-rubber head, and are fired from grenade launchers. Israeli police have been using them in Israel and occupied East Jerusalem since the use of rubber-coated metal bullets was prohibited, but protocol explicitly prohibits firing them at the upper body. The aid worker, along with fellow Norwegian doctor Erik Fosse, decided to volunteer in Gaza as soon as he heard that bombing had started, on 27 December 2008. Thanks to diplomatic and economic support (in the sum of $1 million dollar of emergency funding from the Norwegian Ministry of Foreign Affairs), the two physicians managed to arrive in the strip by 30 December. While volunteering in Shifa hospital, Gaza’s principal medical facility, Gilbert penned an open letter, lamenting the unspeakable horrors the Israeli military was instigating. Ashy grey faces – Oh no! not one more load of tens of maimed and bleeding. We still have lakes of blood on the floor in the emergency room, piles of dripping, blood-soaked bandages to clear out – oh – the cleaners, everywhere, swiftly shovelling the blood and discarded tissues, hair, clothes, cannulas – the leftovers from death – all taken away… to be prepared again, to be repeated all over. At present, the US provides Israel with over 3.1$ billion of military aid per year. In the past 52 years, over $100 billion US tax dollars have been given to the country in military aid alone. Ben Norton is an activist, artist, and freelance writer. He can be found on Twitter at @HeartsMindsEars. RAMALLAH – Dozens of Palestinian activists crossed Israel’s separation wall on Friday near Qalandia checkpoint as part of a series of non-violent protest actions to demonstrate solidarity with Jerusalem. Activists used makeshift ramparts, ladders and cut through barbed wire to climb over the separation wall near Qalandia military checkpoint, which is at least six-eight meters in height. Coordinator of the popular committees, Salah Khawaja, said they attempted to enter Jerusalem but were prevented from doing so by Israeli forces, who deployed heavily in the area. Dozens of activists also demonstrated by the entrance to Maale Adumim settlement waving Palestinian flags. 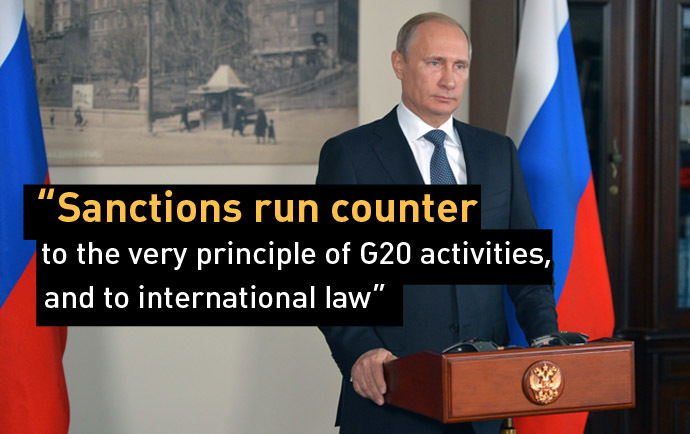 Vladimir Putin says the G20 must address global imbalances together, and economic isolation, especially in the case of sanctions, which not only leads nowhere but is a crude violation of international economic law. Here are the Russian president’s top takeaways ahead of the G20 summit being held in Brisbane, Australia from November 14-15. Putin believes the G20 is still a good and relevant platform for world leaders, however, decisions at the summit are often nothing but words. Decisions made there are only carried out when they are in line with the interests of certain global players, like the US. Decisions are neglected if they don’t fit the agenda of an individual power, Putin told TASS ahead of the summit. An example is when US Congress blocked the IMF quota, which was intended to enhance the role of developing economies and redistribute quotes. That move was counterproductive, Putin said. “The very fact that US Congress has refused to pass this law indicates that it is the United States that drops out of the general context of resolving the problems facing the international community,” the president said. “Everyone must understand that the global economy and finance these days are exceptionally dependent on each other,” Putin said. Sanctions levied against Russia are against the norms of international trade and the core principles of the G20, as they can only be introduced via the United Nations, Putin said. Sanctions against Russia have targeted the finance, energy and weaponry sectors of the economy. Russia’s retaliatory sanctions to ban agricultural imports are having a colossal ripple effect on jobs, social sectors, and growth. This is especially pertinent to Europe, which is feeling the squeeze of the agricultural export ban to Russia, one its biggest markets. Germany’s economic growth is an example of financial blowback from sanctions with Russia. Putin believes that the creation of the 2 US-led trade pacts – one Transatlantic and the other Transpacific – will only create more global imbalance. The US-led Trans-Pacific Partnership (TPP) doesn’t include China or Russia. “Of course, we want to get rid of such imbalances, we want to work together, but this can be achieved only through joint efforts,” Putin said. All new emerging economic blocks like BRICS and the so-called ‘new G7’, which in addition to Brazil, Russia, India and China also includes Indonesia, Turkey and Mexico, should come as something complementary to the existing groups, Putin said. According to purchasing power parity (PPP) BRICS nations have a combined GDP $37.4 trillion, more than the G7’s at $34.7 trillion, Putin said. However, its economic girth doesn’t give it the right to start running its own policy. “And if we go and say, ‘No, thank you, we are going to do this and that here on our own, and you can do it the way you want it,’ this will only add to the imbalances,” Putin warned. The Russian president also said that all regional integrations like the Russia-led Eurasian Economic Union with Belarus and Kazakhstan shouldn’t isolate, but complement, global institutions.